This world-famous athlete and actor was born in Thal, Austria in 1947, and by the age of 20 was dominating the sport of competitive bodybuilding, becoming the youngest person ever to win the Mr. Universe title. By generating a new international audience for bodybuilding, Schwarzenegger turned himself into a sports icon. With his sights set on Hollywood, he emigrated to America in 1968 and went on to win five Mr. Universe titles and seven Mr. Olympia titles before retiring to dedicate himself to acting. Later, he would go on to earn a college degree from the University of Wisconsin and proudly became a U.S. citizen. 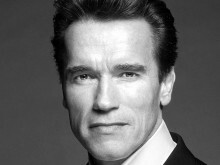 Schwarzenegger, who worked under the pseudonym Arnold Strong in his first feature, Hercules in New York, quickly made a name for himself in Hollywood. In 1977, the Hollywood Foreign Press Association recognized him with a Golden Globe for New Male Star of the Year for his role in Stay Hungry opposite Sally Field. His big break came in 1982 when the sword and sorcery epic, “Conan the Barbarian,” hit box office gold. He is the only actor to be in both categories of the American Film Institute’s “Hundred Years of Heroes and Villains” for roles he played in the Terminator series. Other memorable characters include roles in “Commando,” “Predator,” “Twins,” “Total Recall,” “True Lies,” “Eraser,” “Collateral Damage,” “Terminator 3: Rise Of The Machines” and a cameo in Sylvester Stallone’s homage to action films, “The Expendables” and an expanded role in “The Expendables 2,” among others. To date, his films have grossed over $3 billion worldwide. Schwarzenegger is currently back in Hollywood making films released his autobiography, “Total Recall: My Unbelievably True Life Story,” last fall. Do you want to hire Arnold Schwarzenegger? Directly request a quote. In 48 hours we can send you the availability of Arnold Schwarzenegger If you would like to book Arnold Schwarzenegger, Entertainment Booking Agency is the right place. We will offer you the best price and contact the management or we directly contact Arnold Schwarzenegger. For corporate appearances or speaking engagements you can contact our agents and the will help you true the process. Tags: hire Arnold Schwarzenegger, Arnold Schwarzenegger booking, book Arnold Schwarzenegger, Arnold Schwarzenegger appearances, find more information on booking Arnold Schwarzenegger for appearances, Arnold Schwarzenegger speaking engagements, Arnold Schwarzenegger endorsements/spokesperson, Arnold Schwarzenegger appearance fees, Arnold Schwarzenegger booking agency contact info, biography of Arnold Schwarzenegger, Contact an artist booking talent agent find a speakers bureau that can book Arnold Schwarzenegger, speaker booking agency for Arnold Schwarzenegger, Arnold Schwarzenegger booking agency, Arnold Schwarzenegger booking for corporate event. EBA is one of the biggest entertainment booking agencies in the World. We book hundreds of celebrities, artist, athletes and speakers in a year. Important to know is that we are not claiming to be the management of Arnold Schwarzenegger. We are not the official agent for Arnold Schwarzenegger. Companies from around the globe book these artists and speakers true our company be course we have one of the biggest networks and we always have direct contact with the artist or the management. We help you to find the right celebrities for your corporate of private events. Please contact one of our agents to get free advice and we will help to get the world-famous artist on your party.